One of the great features of the Dragon Age: Inquisition is the ability to prosecute and punish enemies of the Inquisition. You will be responsible for the prisoner's fate, punishing him with death, redemption or exile. The DTG Reviews brings this tutorial that will teach you how to do your duty as Inquisitor. 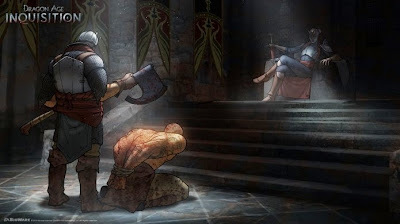 You can only judge and punish your prisoners when you advance in the main story of the game, from the time that takes the role of inquisitor (a). Throughout history, the Inquisition find a place called Skyhold. No details of what happens to avoid spoilers, some missions after the Fortress of heaven is unlocked at the center of the room will be starting the construction of a throne, with Josephine side to monitoring. When your character interact with it, the same state the importance of the throne to the Inquisition. Throughout the game, the Throne will be ready, allowing you to start the trials. Step 1. To find the throne, go to the second floor of the Fortress of Heaven. So to go through the big door, the throne can be seen down the hall. Select the Throne to start posing the trial. Step 2. Josephine announce the prisoner, his crime and, if so, their objections or confessions. The prisoner will always be a character with whom you interacted in past missions and can be a dangerous enemy or a more neutral character, but he committed a crime. Step 3. Depending on the prisoner, you can ask some information to it so you can help in your choice as to what he has to say, for example. At the end of this process, you will choose the punishment of the prisoner, who may be from exile to run in public. After your choice, the trial is over. 1. Depending on the punishment you choose, some members of the Inquisition might disapprove or approve your choice, impacting directly on their relationship with you. 2. It will not always possible to judge prisoners, but always to finish an important mission of the game you will be allowed to judge criminals.